The price is for one pillow only. Elegant blue frost fox pillow, ideal pillow for cold winter months. Transform your home into a "feel-good place" and add a little luxury to your home. 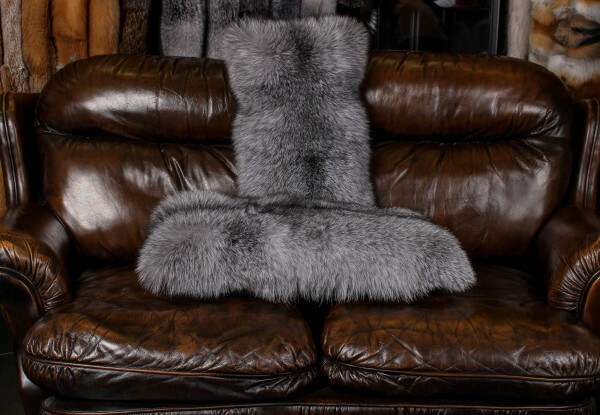 Our master furriers used blue frost fox skins from Scandinavia, which are known for their very thick and soft hair. We always purchase the fox skins directly from the SAGA Furs auction in Helsinki, Finland. We can guarantee you to get a first-class blue frost fox pillow. The blue frost fox (alopex lagopus forma domestica) belongs to the farmed Scandinavian foxes. Blue frost foxes have a grayish-black hair color with a darker stripe in the back of the fur skin. The hair of the blue frost fox is very full, dense and a little shorter compared to other farmed foxes. Responsible handling of the natural product Fur is our concern, which is why we only purchase our blue frost fox skins from well-known fur sources such as the SAGA Furs auction in Finland and the Copenhagen Fur in Denmark. If you decide to buy a product from Scandinavian blue frost fox, you can be sure to receive a first-class product from guaranteed excellent fox farms according to high European standards. We produce blue frost fox fur blankets, fur pillows, and accessories. If you have any questions regarding our blue frost fox fur blankets, please do not hesitate to contact us. Ссылки на другие веб-сайты "Blue Frost Fox Pillow (SAGA Fox)"
Оценки покупателей по "Blue Frost Fox Pillow (SAGA Fox)"